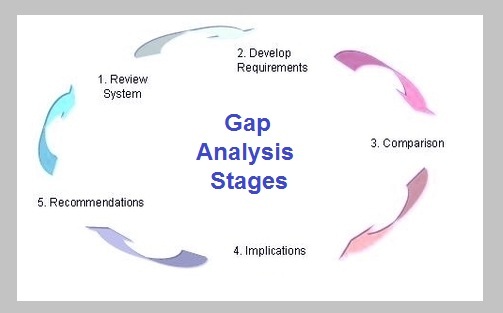 Gap Analysis – Gap Analysis – Gap Analysis Framework – Gap Analysis Business Methodology – Gap Analysis is a business tool aimed at identifying gaps and / or problematic areas by a given business process or a department. Usually gap analysis utilizes a point of reference, e.g. an industry benchmark that serves as a comparisson point. Sometimes, benchmark would not be present, as instead you would specify where the business wants to go, and where the business currently is, what is the gap, how can this gap be breached, i.e. development of recommendations. Gap Analysis - this diagram visually depicts one of the common business frameworks, used by leaders to develop company strategy, tactics, models and approaches in an effort to enhance operations, marketing, develop new products and improve company competitive position.. This entry was posted in Analysis and tagged business gaps, gap analysis, gap analysis analysis, gap analysis approach, gap analysis business, gap analysis chart, gap analysis diagram, gap analysis example, gap analysis examples, gap analysis explained, gap analysis framework, gap analysis methodology, gap analysis sample, gap analysis stages, gap analysissamples by admin. Bookmark the permalink.